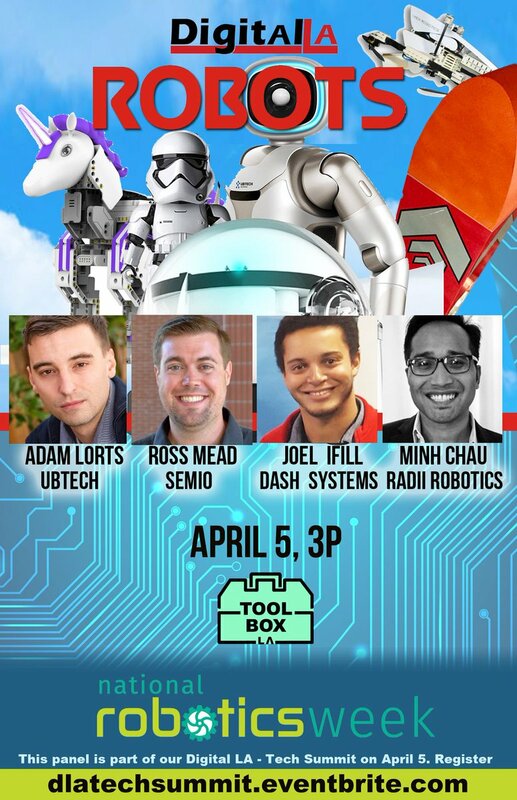 Robot experts and startup founders will discuss trends in robotics. This is our Robots panel part of National Robots Week. - Adam Lorts, UBTECH, Director of Enterprise Sales - North America. UBTECH Robotics is the global leader in intelligent humanoid robots. The company’s interactiverobots serve the public, accelerate STEM education for children and assist & entertain in the home. Its robots include Stormtrooper, Walker, Jimu Unicornbot robots for kids, Ruzr service robot, and more. - Dr. Ross Mead, Semio, CEO and Founder. Semio is an LA based software startup that allows robot developers to rapidly create and deploy robot apps, and allows robot end-users to transparently access and use those robot apps. - Minh Chau, Radii Robotics, CEO and Founder. Radii Robotics uses spatial AI to pioneer the development of an aerial robotics platform thatcombines drone mobility with human dexterity to replace manual labor performed at high altitudes. - Aaron Lucas, Area 51 Robotics, CEO/Founder. Area 51 Robotics is a new startup that provide robotics education classes. Several Tech Startups in robotics, space, drones, maker, etc. pitch what they do for 5 min with 5 min Q&A.. CALL FOR SPEAKERS: If you are in robotics, space tech, maker / 3D printing or biotech, email info@digitalla.net with SUMMIT as subject and a brief bio. PARKING: Free parking available in the Toolbox LA parking lot.